There’s no one policy or criteria that makes a place a sanctuary city. Yet two executive orders signed by President Donald Trump on Wednesday — including one that would crack down on sanctuary cities — could impact the city of San Diego, the county and the state bigly. Here’s what it takes to become a sanctuary city: You, or someone else, starts calling your city a sanctuary city. That is, there’s no one policy or criteria that makes a place a sanctuary city. 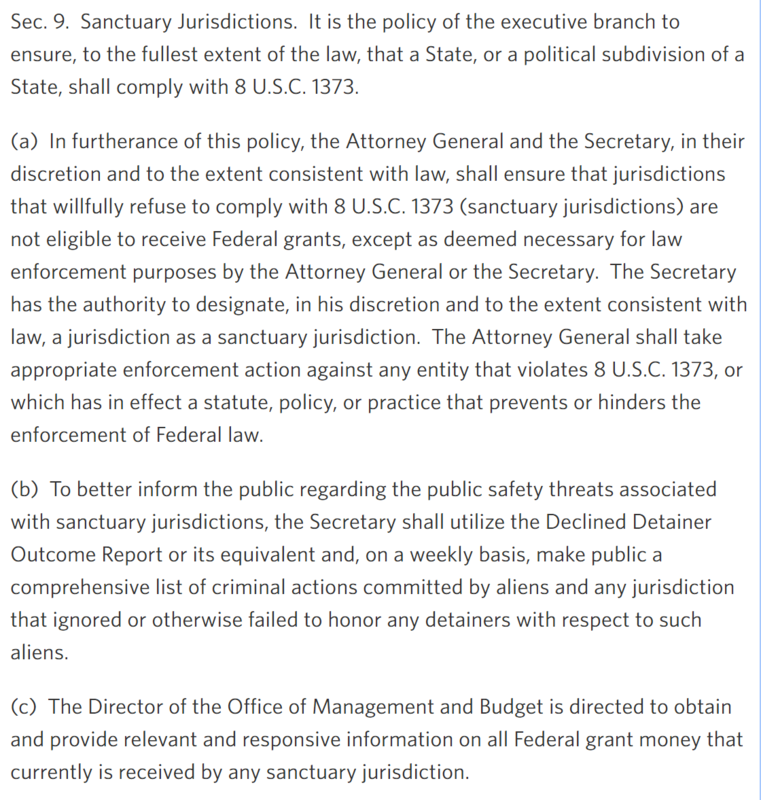 So when President Donald Trump announced in an executive order Wednesday that he’d withhold federal grant money from sanctuary cities, it wasn’t immediately clear who he was talking about, or what criteria he’d use to identify offending locales. Places that are considered sanctuary cities might be ones that prohibit their jails from inquiring about immigration status, refuse to alert Immigration and Customs Enforcement when an undocumented immigrant will be released from custody or decline to assist with other enforcement activities. Whatever definition the administration uses could matter quite a bit, since San Diego has popped up on lists of sanctuary cities for years even as its leaders insist it isn’t one. A separate order signed by Trump on Wednesday could impact San Diego bigly as well – it’s the one greenlighting a border wall and related enforcement and detainment actions. Plenty of websites have compiled lists of sanctuary cities, and San Diego lands on many of them. But the mayor’s office has said San Diego is not one. SD already has a border built by the Feds. Crossborder trade creates jobs. Our binational economic & cultural ties have my full support. A separate order signed by Trump Wednesday deals with a policy known as 287(g), which allows local law enforcement officers to act as immigration enforcement. Trump wants police agencies to use 287(g); President Barack Obama did not. When the Union-Tribune asked San Diego Police Chief Shelley Zimmerman in November about whether the department would implement the program, she didn’t answer the question directly. Her statement does, however, explain why supporters of sanctuary policies believe the designation is crucial: Immigrants might be dissuaded from reporting crimes if they believe contact with police officers will lead to their deportation. “The San Diego Police Department does not check the immigration status of victims and witnesses of crimes to encourage all people to come forward, confident in the knowledge their report will be investigated thoroughly and professionally,” Zimmerman told the U-T.
Assemblywoman Lorena Gonzalez, whose district runs along the U.S.-Mexico border and also includes refugee-heavy communities in City Heights, said this is one of her biggest worries regarding Trump’s action. “For decades, our police officers have worked very hard to have this relationship with immigrant communities, and there is a certain trust there. What he’s done today is breaking that up,” she told me. “If you’re a victim of a crime, the most unsafe thing we could do is to allow police” to arrest the very people who step forward to make a report. The California State University system, which includes San Diego State, doesn’t use the word “sanctuary,” but last year declared it won’t cooperate with any federal policies that zero in on undocumented students. The University of California announced similar policies, and the University of San Diego’s president said he would form a task force to explore the issue. San Diego County is home to 743,500 immigrants, according to a report from the Immigrant Legal Resource Center. We don’t know how many are undocumented. The Sheriff’s Department, for example, allows what are called detainers – requests from Immigration and Customs Enforcement to hold an immigrant after he or she is supposed to be released, so ICE can detain them. California could be considered a sanctuary state, if that was a thing. The state’s TRUST Act went into effect in 2014, and limits the ways in which local jails can hold people in order to turn them over to immigration officials. In most cases, local law enforcement can’t hold those who’ve been arrested for minor crimes, including most traffic offenses. San Diego Sen. Joel Anderson cited that as the reason he declined to support Becerra’s nomination. “Californians deserve better than a top law enforcement officer who wants to protect illegal alien drunk drivers. As a supporter of sanctuary cities, that’s exactly what Congressman Becerra wants to do,” Anderson said in a statement before Becerra was sworn in. Other San Diego legislators, however, condemned Trump’s order. One, Sen. Ben Hueso, who is chair of the state’s Latino Caucus, already introduced a bill this session that would give legal representation to immigrants facing deportation proceedings. “Building walls is a failed political policy that should remain in medieval history,” Hueso said in a statement. So when state officials say they want to limit or fight Trump’s order, what exactly do they mean? Others have suggested that Trump is goading California into a legal challenge it can’t win. Gonzalez said former Attorney General Eric Holder, who has been hired by California to help push back against Trump administration policies, will be exploring whether his immigration actions represent a violation of the 10th Amendment to the U.S. Constitution, which prohibits the federal government from forcing states to provide resources or personnel for federal enforcement actions.